When you think about the repercussions of a fire, your first thought is probably the damage to your home. You’ve likely taken the normal precautions to ensure that your home is not susceptible to a house fire. Or, if it is, you have taken protective measures such as installing smoke detectors so you and your family can be alerted quickly and minimize risk and damage. But shouldn’t you take the same precautions for your office? Could you afford fire damage to your business? When looking at the damage a fire can cause, many forget that a fire is only part of the damage. Smoke can have disastrous effects on your office building, as can the process of using water and chemicals to stop the fire. This is why prevention is so crucial. To get started, take steps to ensure that your business is taking every precaution to prevent a fire as well as having an action plan should one occur. Do you have a current fire plan in place? The Natural Resources Canada page has guidelines to help you with your plan. From identifying potential fire hazards, all the way to performing scheduled fire drills to prepare your staff, it is important to have a clear plan in place that your staff is comfortable with. You and your staff need to be able to understand what steps should be taken if a fire occurs. Once a plan is set up, make sure that your staff understands any guidelines you have set to prevent fires in the workplace. Be clear that it is everyone’s responsibility to incorporate the following steps into their everyday work life. After taking a good look at your office, you now have a list of potential fire hazards and can take preventative measures. Ensure that coffee makers, microwaves, and other appliances are unplugged at the end of the day. Make sure that trash areas are clean and are not located near any hot surfaces or equipment. Use surge protectors when multiple items need to be plugged in at the same time. Do you have employees who smoke? Designate an area outside where employees can smoke. Provide a place where cigarettes can be disposed of. Have fire extinguishers at key locations. Make sure that everyone on staff is trained and comfortable using a fire extinguisher. Have smoke detectors on every floor. Ensure smoke detectors are checked regularly and that batteries are charged. Make sure that multiple fire escape routes are available to staff and that a central meeting point has been designated. 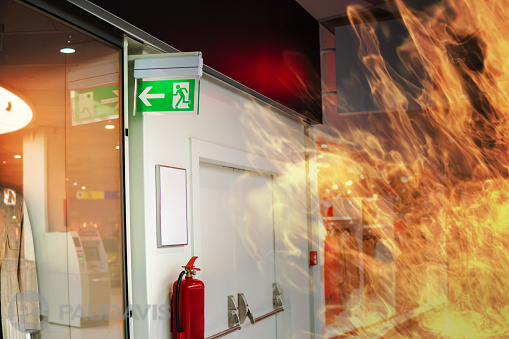 When fire-related damage takes place at a commercial business, call the experts at Paul Davis. Because anytime fire damage occurs, This Is No Time For Second Best ®.